In 2005, Liberty Science Center put out a highly-selective call for proposals for a commissioned piece to be shown in their internal lobby, a 40’ cubic void with three-stories of balcony on each side. They were inspired by the vibrancy and information richness of Times Square (some 10 miles away on the other side of the Hudson River). Onomy asserted that Times Square is a historical accident – an accretion of state-of-the-art displays (spanning many years, some now quite dated) on surfaces available for appropriation. The LSC lobby offered the opportunity to author a set of displays for a specific purpose – to educate the attending public about how science is a dynamic and lively topic, with new findings emerging every day. We won! 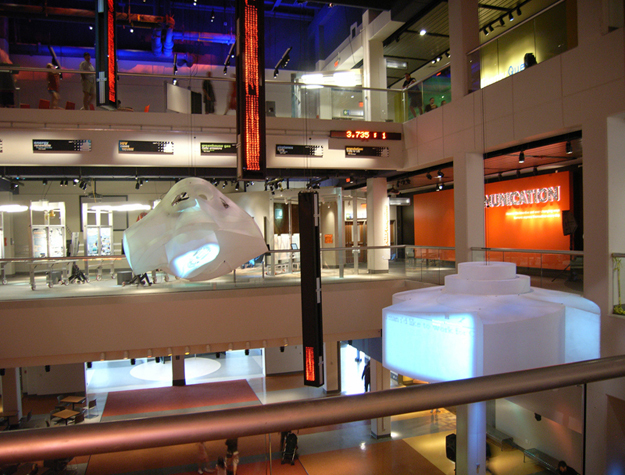 Our pieces for LSC are dominated by a giant media-rich mobile we designed and built that hangs in the atrium space, consisting of three large thematic objects relating to the themes of the facility - health, innovation, and environment. Each shape has three projectors inside, showing internet-harvested images and videos of very current advances in science and technology on the surfaces of the shapes. The shapes' counterweights are large zipper signs that scroll science and technology news releases. Each shape-counterweight pair is motorized to change heights over the course of the day to better aaddress the various levels of the space. By harnessing the cloud of available information, these thematic cloud objects are always fresh. The large plastic shapes were built using Lamina, and fabricated with Onomy's custom lasercutter. Also in the space are additional motorized displays that run more zipper signs along the spandrels of the atrium. These visitor-controlled devices reveal Vital Signs about the health of the globe -- how many people are afflicted with AIDS, how many earthquakes since the start of the calendar year, how many jetliners are currently in the air, etc. ).